An upcoming bike build will need cantilever brakes. The frame is new (more on that later), but vintage cantis would not be inappropriate for the project. As I am not a fan of V-brakes for road bikes, I am exploring the many cantilever options which are available for a frame with canti braze-ons. 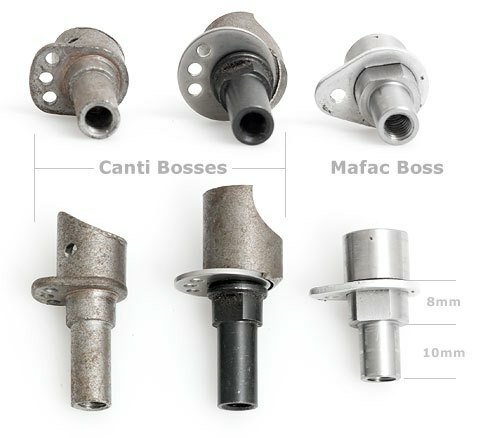 Modern cantilever brake options include Paul’s, shown above, as well as other models from Shimano, Dia Compe, Velo-Orange, Avid, and Tektro.. With all these alternatives, it can be hard to determine the best set of cantilevers for a given application. Beautiful Dia Compe 960 Cantis – in as new condition. 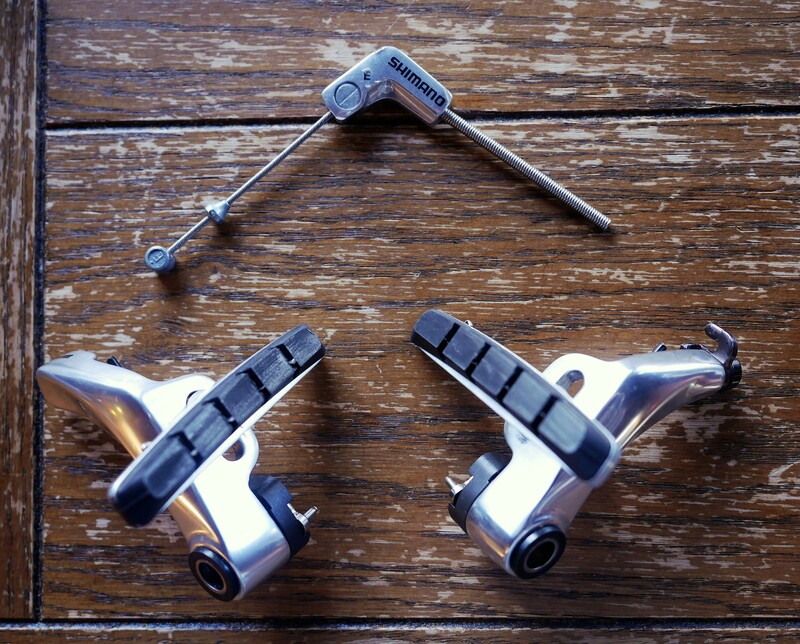 But before that a primer on cantilever brakes was in order. While there are many factors to consider, one of the important ones involves whether you want your springs integrated into the brake or not. 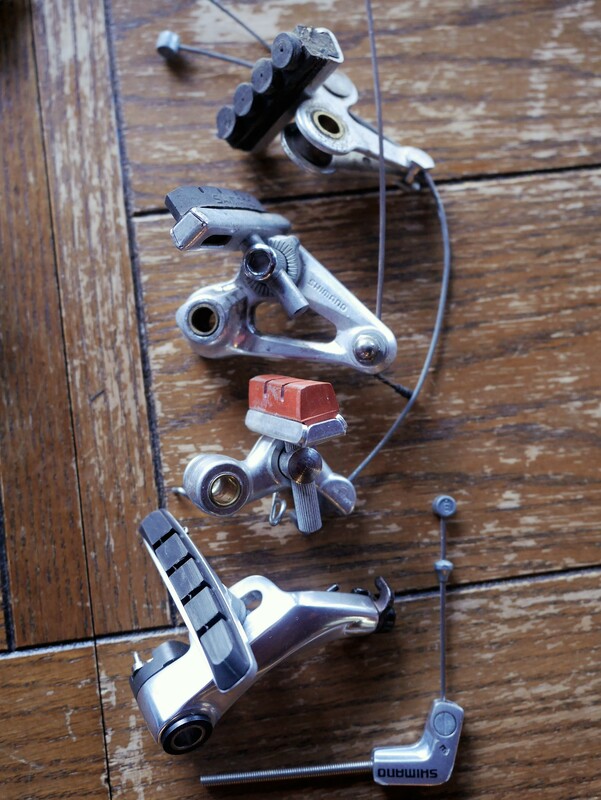 Newer cantilevers, such as the Shimano’s shown in the top photo, have integrated springs that allow for separate spring tension adjustment on each caliper. Older cantis, such as the Dia Compe’s in the lower photo above have external springs. 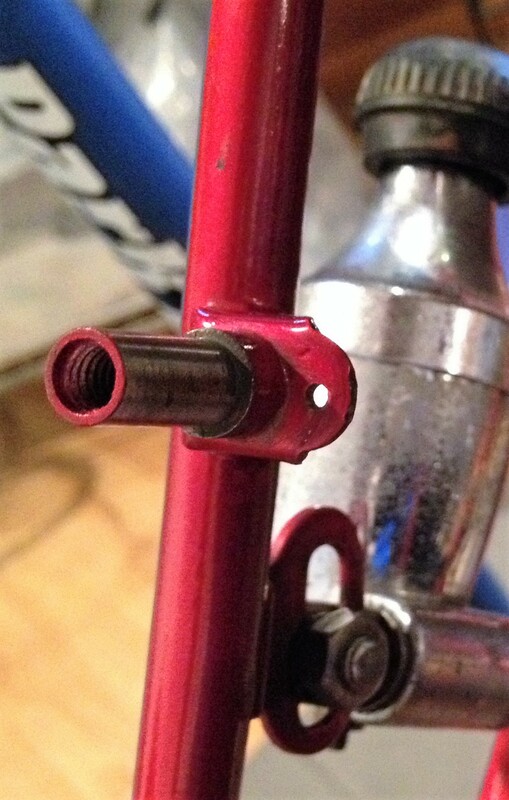 The only way to adjust spring tension on older cantis is to mount the spring into a different hole on the canti brake boss (some bosses have 3 separate holes to allow for this). Or, the spring can be modified with “strong arm” force by changing its shape. Fortunately, the bike I am working on has 3 hole canti bosses, so I can take the time to evaluate vintage vs. modern caliper options. If you have a newer bike and you want to change your cantilever bosses, you can unscrew them from the frame and add a different plate or a different length stud. Paragon Machine Works is a good resource for sourcing canti studs and plates. Meanwhile, one has to wonder about the shape and angle of the caliper arms. It would seem logical to conclude that the arms with the widest angle would have the most mechanical advantage. But apparently one must think again. 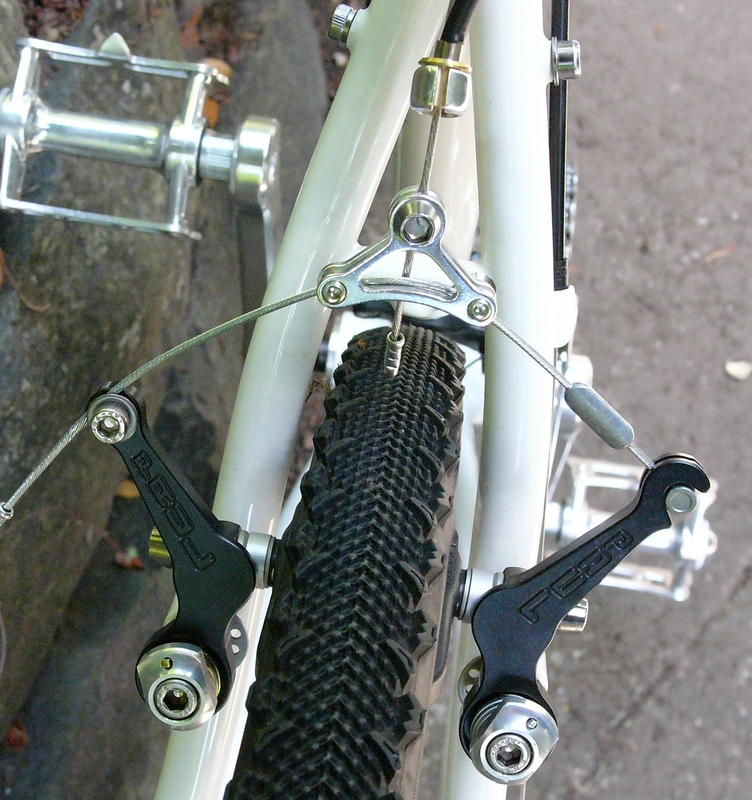 Low profile cantilever brakes can have as much mechanical advantage as calipers with a more extreme angle. Why? It all depends on the position of the straddle cable, according to Sheldon Brown. I experienced this when setting up Tektro canti’s on my 1987 Panasonic commuter bike. I had to position the straddle cable very low, but in doing so I found that the brake performed quite well. The rule of thumb is to not set the yoke below the bottom of the fork crown. While the angle of the straddle cable looks extreme, the brakes work just fine. The Mafac cantilevers in my collection are the lightest weight calipers among the group. Their springs are external of course, but with the 3 hole option on the frame’s canti bosses, I am leaning toward installing them. We’ll see! This entry was posted in Bicycle history, Bicycle restoration and tagged Cantilever Brakes, Cantilver brakes, dia compe brakes, Mafac cantilevers, Paul's Cantilevers, Shimano Cantilever by Nola Wilken. Bookmark the permalink. Did you also consider Compass Cycle’s canti’s? Oops – forgot abut Compass’ offering. They offer a beautiful and lightweight set which is a copy of the original Rene Herse design. Spendy at over $300 for a set – but possibly worth it? It’s not the position of the straddle cable that makes the difference. The applied force is either increased or decreased, depending on the distance from the fulcrum (the point or support on which a lever pivots) to the load, and from the fulcrum to the effort. 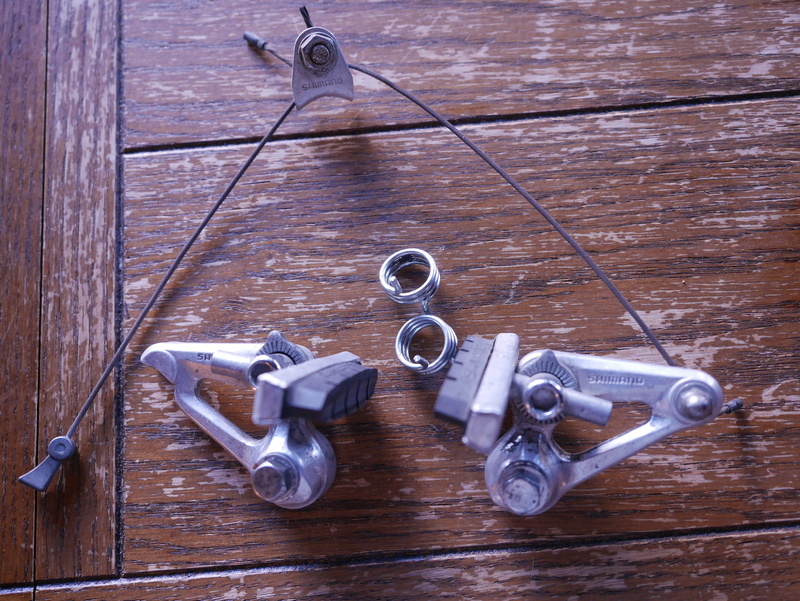 In the case of cantilever bicycle brakes, the fulcrum point is the brake pad. The longer the arm length from the fulcrum (brake pad), to the cable point (the effort), the greater the pressure that can be applied to the pad. The shorter the length, the less pressure. Also – a shorter length from the fulcrum (brake pad) to the load (the boss) will increase the braking pressure. The longer the length, the less pressure. Excellent points! Modern cantis have toe in adjustment built in to the design, although they tend to be significantly heavier than their vintage counterparts. 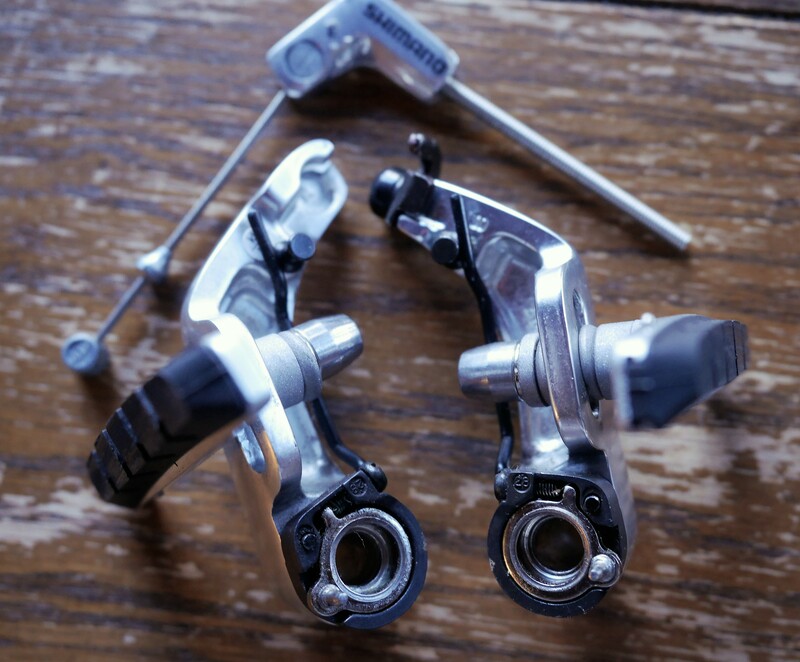 With the pad as the fulcrum, brake squeal can be an issue, so toe-in adjustment is important. I should also state that the angle of the straddle cable makes a big difference. The shorter the cable, the better the braking. The reason for this is because the shorter the cable, the greater the force is applied towards the rim (sideways pressure). If cable is too long, much of the force is going in an upwards direction, instead of sideways. With respect to my 1988 (or so) Bianchi Advantage. I had removed the front reflector bracket and reflector many years ago , not knowing how critical the bracket is for protecting the front tire / wheel from the cantilever front brake transverse cable in the event of a main cable break (see Sheldon Brown’s discussion at : https://www.sheldonbrown.com/canti-trad.html ) . When the main brake cable broke, it caused the upside “V” transverse cable to get snagged on the front tire , essentially bringing the wheel to an immediate freeze. I went up and over, and even with a helmet on (thank goodness), I had facial fractures , lacerations, and road rash (I’ll be OK with time). 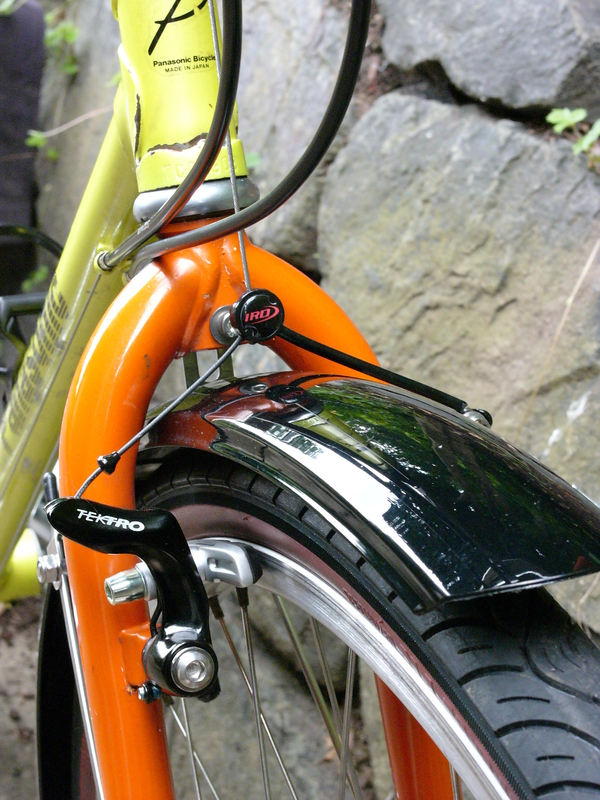 So, be sure to cover a front tire using a canti with a fender or reflector bracket ! Bob – thanks for pointing out this important safety warning: cantis need either a fender or a reflector bracket between the straddle cable and the tire. Otherwise: disaster could strike, and this is why V-Brakes came into being. 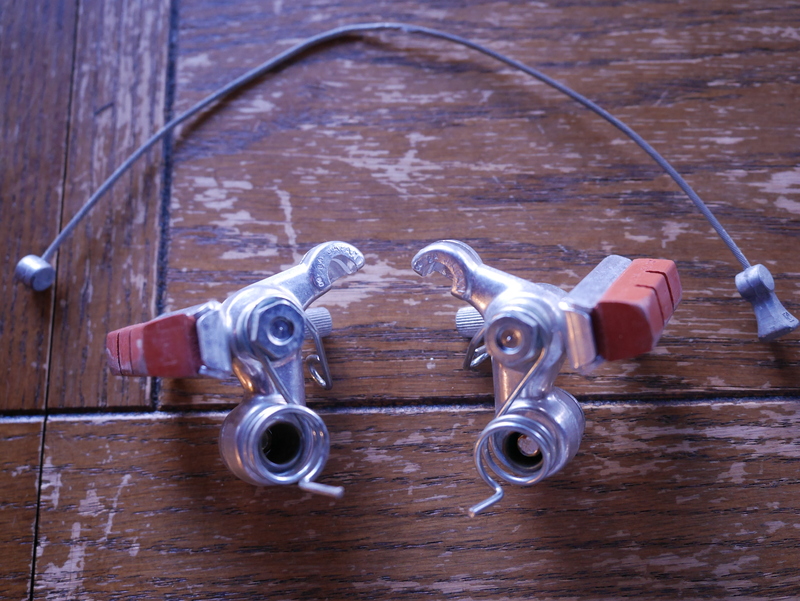 Another set worth considering are the shimano cx50 or the discontinued cx70. With their adjustable spacer system it is possible to use a new brake set on the narrow spacing of a vintage frame. 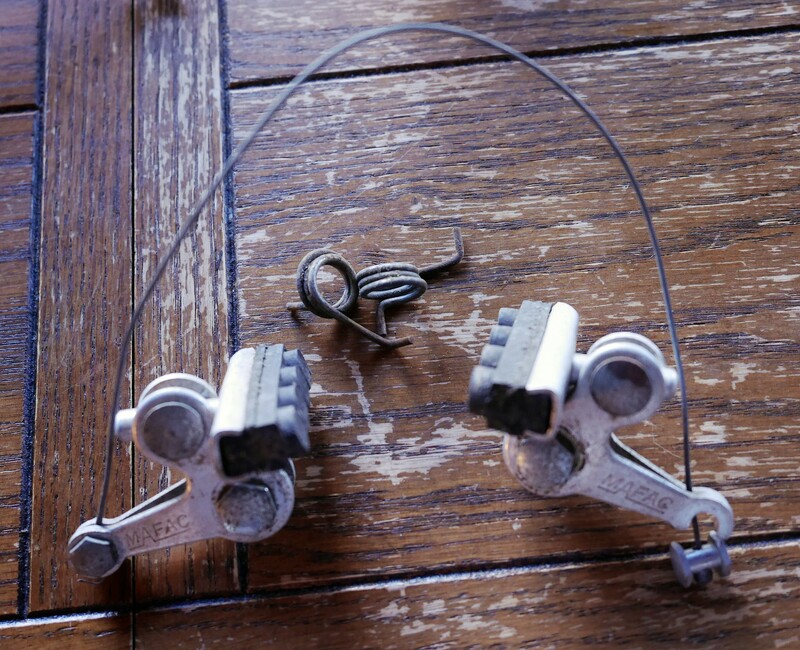 I went to them on my fuji touring bike, the old vintage brakes just don’t have enough arm for leverage. Thanks for mentioning this. Not all modern cantis will work with the narrower spacing on older frames.